Does anyone know where this wire goes? I'm currently wire tucking the complete harness, everything invisible so far, and I need to know where I can/have to make this wire go to before continuing. If it's a powered wire, I'll have to replace the whole wire with a new, same thickness wire, if it needs to be extended, because I don't trust crimp terminals on wires this thick on powered wires when extending wires. 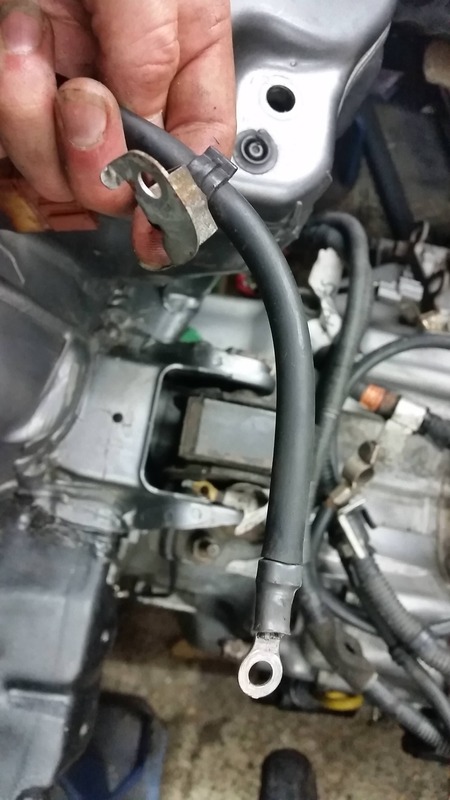 That wire goes to the stud on the alternator just in front of and below the big green connector on the side I know that wire runs from the small stud on the alternator to the front of your under hood fuse box. I’m not sure if it’s a ground or power. But I’m thinking it’s power for the electronic load detector. Last edited by Grumpys93; 08-04-2018 at 07:14 AM. I realised a few minutes before I saw your post that I still had an intact harness from another accord where that wire was still attached to the fusebox, lol.